RoboGEO is Windows software for geocoding digital photos. In order to know WHERE a photo was taken, it must be "geocoded". A geocoded photo is one which has location data embedded into it - location data like the latitude, longitude, altitude, direction, etc. Once embedded, the location data stays with the image and can subsequently be extracted and used to pinpoint the photo on a map, stamped onto the physical image, used to create a Google Earth file, etc. Here's a very simple example of a photo that was geocoded with RoboGEO. RoboGEO provides all of the features you need to geocode photos and to make use of the embedded location data. Important note: This documentation only applies to RoboGEO v5.10.0 and higher. If you're using an older version, you should upgrade to the latest. 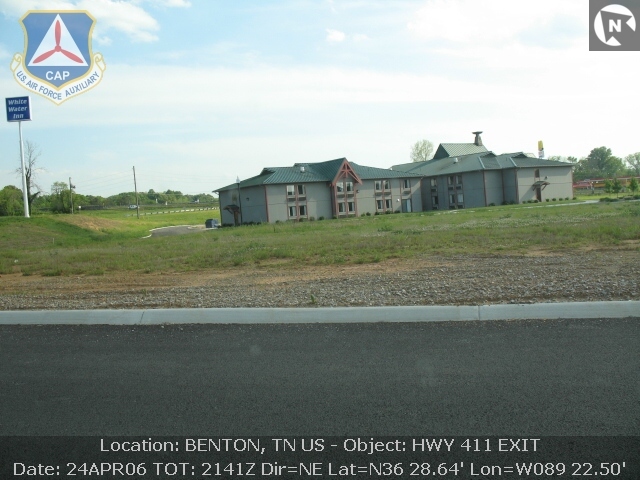 The Civil Air Patrol has very specific requirements for stamping location data onto images. RoboGEO can be configured to output photos in the format that the Civil Air Patrol requires, i.e. instead of producing simple output like this, the program can produce the required output that looks like this. That's all there is to it. Start the program like that and you'll produce the required output. It's possible that your local commander may require additional options beyond those embodied by the /cap command line switch. If that's the case (s)he may require you to load a configuration file from the web that includes those options. To load a configuration file from the web, select the 'File -> Open -> From the Web' pull-down menu option on the Preferences form. In the input box, type in the complete URL that they provided to you. Your commander may also require you name your images a specific way. Use the file renaming tool to do that. If you need to easily edit the image titles, use the Title Maker. You can also edit the titles by typing directly into the grid. The steps below assume that you're new to RoboGEO and that you want to get up-and-running ASAP by way of an example. 1. Download and install the demo version. 2. If you've been issued an unlock code, enter it to fully upgrade the demo version to registered. Help is here. 3. If you don't have any images to work with, download and use these. They are already geocoded, so when you load them the location data will automatically appear in the grid. Don't forget the quotes if your path contains spaces like the one above. If you have a desktop icon that points to RoboGEO, you can modify that by entering the same thing in the shortcut's 'Target' field. 5. Load all of the sample images by pressing F2. These were previously geocoded, so you don't need to do anything else to them. Note: you can also import CSV files to assign data to photos. 6. Stamp them by selecting the File-->Process-->Stamp Images pull-down menu. If you're not overwriting the original images (the default), select an output folder. This is where the processed images will be saved. 7. You'll then be prompted whether to specify the north arrows. Select Yes. If all of the images have directional information associated with them, the north arrow orientations will be automatically determined and you'll be advised of that. All you need to do is press the 'Done' button to exit the form. To specify an image's north arrow, you must specify the rotation angle (measured clock-wise from north) of the north icon graphic. For example, if north is straight down, as would be the case if the direction of the image was pointing south, the north icon rotation would be 180 degrees. If the photo direction is pointing to the east, the north arrow would point to the left, meaning it has a rotation angle of 270 degrees. For example, in the sample graphic, the north arrow rotation angle is about 135 degrees (this means that the direction of the photo would have been about 225 degrees). More information about the north arrow is here. 8. Once you've specified all of the north arrows, you'll be prompted whether to load the IPTC editor. 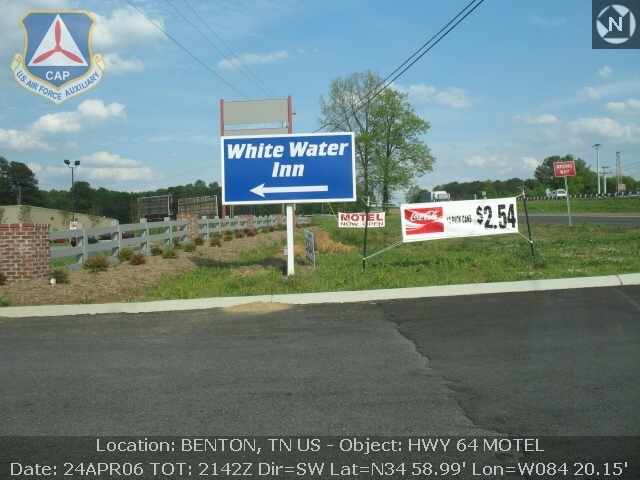 Referring back to the sample image, "Benton, TN US" and "Hwy 64 Motel" were obtained from the image's IPTC headers, so you must specify them. On the IPTC Editor form, specify everything on the 'Location' tab. You can ignore the 'Description' tag, but it may be a good idea to enter that data too for possible future use. After entering the data for each image, be sure to click the 'Write IPTC' button. When you're done, close the IPTC editor form. 9. The images will then be stamped with all of the information and they should look very similar to the sample image. To review the results, double click on an image in the grid and then select 'View' from the resulting pop-up menu. RoboGEO offers several ways to geocode photos. 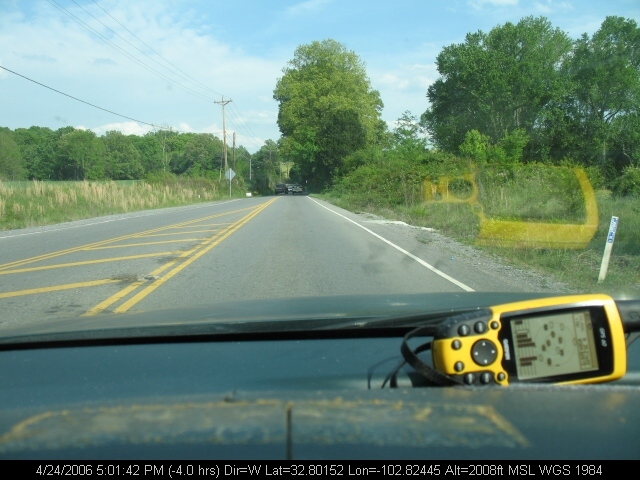 In this real world example, we'll assume that you're using a Garmin handheld GPS that will be recording a tracklog during the flight and that you'll use the tracklog to geocode the images. 1. (Preflight) Ensure that your camera's clock is accurate. A good method for doing that is discussed here. 2. (Preflight) If you don't need it and if you'll be displaying it in your output, erase the GPS's tracklog. 3. (Preflight) Begin recording a tracklog with your Garmin GPS. 4. Take flight and snap photo(s) of your target(s). 5. (Postflight) Back at the Windows computer, start RoboGEO with the /cap command line switch. 6. (Postflight) Select the images (press F2). 7. (Postflight) Geocode the images by loading the tracklog. 8. (Postflight) Follow the same instructions as above, beginning with item #6. It would be a good idea to include the first 3 items on your normal preflight checklist. The key thing to realize is that once you're in the air, you don't need to focus on anything but your mission. You'll geocode the images later once you're back on the ground and relieved of your cockpit duties. The program's documentation is both on-line and local. Note that you can quickly navigate the online help by clicking the screen capture graphic at the top of each help topic - click on it as if it was the actual program, i.e. click on the 'File', 'Edit', and 'Help' areas. If you have questions, comments, of if you need additional features implemented, contact the author directly at tim@robogeo.com.